I have owned a Baretta Vertec for several years now. Not long after I purchased the pistol, I purchased the Bianchi Model MH05 holster. I have seldom used this holster because of it's bulk and because you should really use a tactical heavy belt to properly support the holster. OK, lesson learned. Buy a holster targeted for the real situation which you plan on carrying the gun. My real situation is around town or on the farm. What I wanted was a holster that didn't require a special belt and yet felt secure on my hip. I also wanted a holster that was form fitted to my pistol and compact. My choice was the Fobus Beretta Vertec Roto Paddle Holster. You can get this holster from Fobus for $35.99 plus S&H. 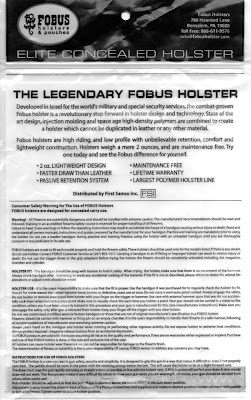 Below in italics is what Fobus says at their website about this holster. Retention adjustment screw allows user to ease of presentation with security of retention. Patented locking adjustment system allows for forty (40) possible positions. The photo below shows the Fobus Beretta Vertec Roto Paddle Holster in it's packaging. Throughout this review, if you click on a photo, it will bring up a higher resolution photo so you can see more detail. The back of the packaging is shown in the photo below. 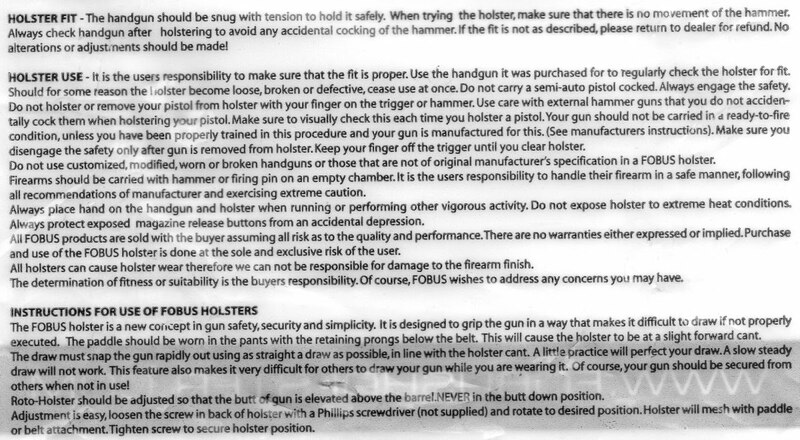 One of the key things to read is the section on "Instructions for Use of Fobus Holsters" which I have blown up to make sure the text is readable. I will add some detail further in this review. Inside the bag was the fully assembled holster and a NRA brochure. The series of photos below show different views of the holster without a pistol. If you see any scuff marks, those were due to me already using the holster prior to taking the photos (another lesson learned). The next photo is of the details of their Roto feature. I removed the single screw and you can see the ridges that make up the 40 increments to allow 360 degrees of rotation of the pistol on the paddle. In reality, you would only cant your pistol forwards or backwards within a practical range. The next photo shows the Roto feature even closer, but the reason I'm showing this photo is so you can see the upper three rivets. 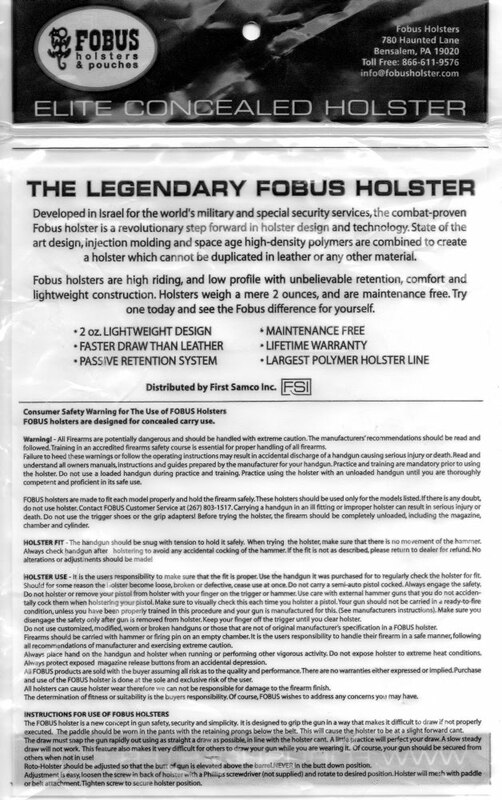 Fobus's advertising says "Steel reinforced rivet attachment system (paddle and holster body)". I reviewed another holster that did not have this Roto feature and there was a small band of steel under the back of these three rivets on that holster. You can see the other holster review at this link to compare. I don't believe that this holster has any steel reinforcement. Due to the two lower rivets, I don't think the reinforcement was required on this holster and their statement may just be an error when setting up their website. The pistol is held in place by a passive retention system which is a dimple inside the holster. The outside of the dimple can be seen in the photo below. You can also see the adjustment screw to adjust the amount of resistance you want when drawing your pistol. As you tighten the adjustment screw, it flattens or relaxes against the red o-ring. Tightening the screw squeezes the two molded sides of the holster together and creates more resistance when drawing your pistol. Before I evaluated the fit of the holster with a pistol, I wanted to check it's weight. Fobus's packaging says "2 oz. Lightweight Design". The photo below shows that this is clearly not a 2 ounce holster. The holster is weighing in at nearly 4.5 ounces. Personally I don't think the weight is an issue, especially when compared to my Beretta Vertec with an 18 round clip, but it is not 2 ounces. Next I evaluated the fit of the holster with my pistol. The series of photos below will give you a good visual understanding. Overall I liked the basic fit of the pistol in the holster, but it did have a little front to back looseness. The last thing I needed to review what how the holster functions. When I initially received the holster, the adjustment screw for tightness of draw was very tight. I could barely get the pistol in the holster. I loosened the screw until it was finger tight. At that point, the pistol would go in and out of the holster easily. From there I tightened the screw until I was comfortable. With the holster in place on my side, I started trying to draw the pistol. 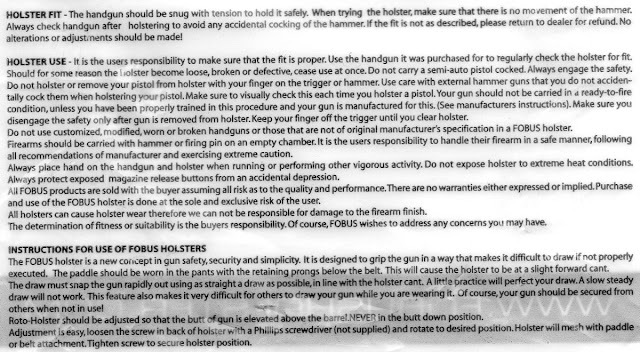 Remember above in the Fobus instructions it said "The draw must snap the gun rapidly out using as straight a draw as possible, in line with the holster cant". This is the most important thing you should remember when initially drawing the holster until you get the hang of it. During my first couple of attempts, I actually pulled the holster out of my pants (in my case I tend to wear baggy shorts/jeans with a rope mesh belt). In the past weekend I have practiced drawing the pistol hundreds of times (yes my wife thinks I'm nuts) and the pistol comes out effortlessly and the feel is natural. Once I had the feel of the holster, I asked my 20 year old daughter to try to remove the pistol. Because of the fit and required removal technique, she was not able to get the pistol out of the holster. I consider this a good thing because I wouldn't want it to be easy for someone else to pull the pistol out of the holster. I think FobusFobus Beretta Vertec Roto Paddle Holster is worth the money. It definitely takes some getting used to when drawing out the pistol. I believe that this will be the case with any polymer molded holster that uses a passive retention system. The most important thing anyone can do with a holster and pistol is become comfortable using them, which means practice, practice and more practice. If that day ever comes when you need the pistol, you will not regret the practice. Hiding the gun is a skill, which every gun owner should know. A good holster for your beretta is important to cover it. There are various holster for beretta shotgun. some important are Falco Holsters, Fobus Pistol Case Paddle Holster,BLACKHAWK.